You can do the layers in what ever color scheme you want. I always start bottom (Black Cherry) up. You can also use different flavors if you choose. Make sure you have a FLAT surface in your refrigerator. IF it is not flat, putting a folded paper toweling under one side of the dish to even it out also works. Mix the first layer. Boil 1 1/2 cups of boiling water with the first jello packet and pour into the pan or mold you are using. Put it in the fridge and let it set COMPLETELY. Mix the second layer. 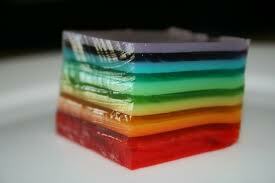 With the second jello packet add 1 Cup of Boiling water and 1/2 cup of evaporated milk. (DO NOT POUR OVER FIRST LAYER YET) What I do is let this second layer cool in the bowl. (DO NOT PUT IN THE FRIDGE) ONCE it is cool, THEN you can pour it CAREFULLY over the first layer in the pan or mold. YOU MUST make sure that the first layer that is in the fridge is set, and the 2nd layer you have mixed up in the bowl is completely cool, or your layers will melt together. Continue doing layer, after layer alternating. One layer is just made with a cup and a half of water, and the next layer is made with only one cup of water and a half cup of evaporated milk. THAT IS IT! It is a little time consuming, but WORTH EVERY SECOND!